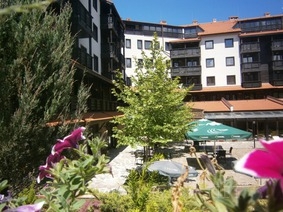 Casa Karina Aparthotel in Bansko mountain resort in Bulgaria. - 15 % discount until 15 Dec 2018. The early booking discounts and extras are not combinable! Location: Casa Karina Aparthotel is a luxury hotel located in Bansko resort at the foot of the Pirin mountain. The hotel is located just 100 m away from the gondola ski lift and Kempinski hotel, 250 meters from the Pirin Park and about 1000 meters from the center of Bansko. Accommodation: Casa Karina Hotel offers 80 guestrooms – studios, one-bedroom apartments and two-bedroom luxurious apartments. All apartments are stylishly furnished and offer luxurious bathrooms. Most of the apartments offer magnificent view towards the Pirin Mountain. - Room-service – paid service.